On the US 395 route from Reno towards Alturas there is a roadside rest area, and just to the north of that, the BLM Ramhorn Springs campground. The rest area is on a grade and is rather a squeeze for an RV. The campground is on the other side of the summit and a bit easier if you don’t miss the turnoff. 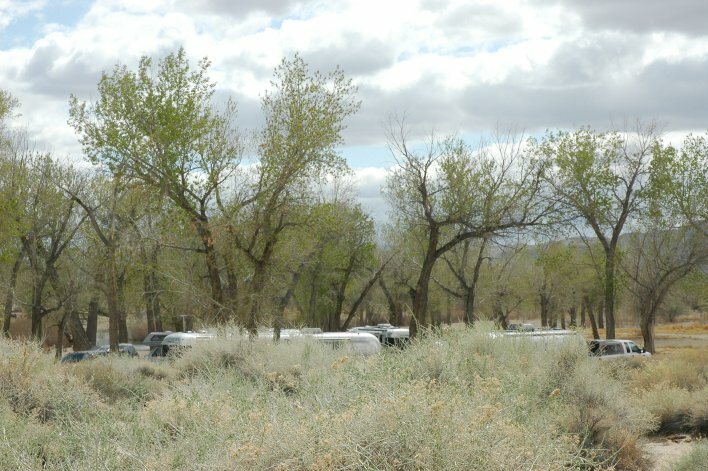 The BLM website has a picture of Anita from the SNU scouting out the campground. The Bay Area Equestrian Network knows about this little campground, too. Their page on horsecamping at Ramhorn Springs provides a campers viewpoint of the area and some of the trails nearby. There is a coral at the campground suitable for maybe three horses. Hopefully the SNU won’t decide to rally there the same weekend a horse club does as happened at Scout Camp at Fort Churchill! Ten campsites, 1 vault toilet, and a coral don’t leave room for a big gathering. But that sounds about right for the SNU bunch. A newspaper account of a recent fire from the Lassen County Times. A photo journal of the area. The 74 year old motorcyclist is in intensive care after the 28 April incident where the tire and wheel bounced over the median barrier and hit her. This is why you need to repack trailer wheel bearings frequently, keep an eye on hub and tire temperatures while on the road, and check the lug nut torque after having any tire or wheel work done. You don’t want one of your wheels doing damage like this one on U.S. 395 did. The remodeling section of the owner’s guide has a new addition and a facelift. 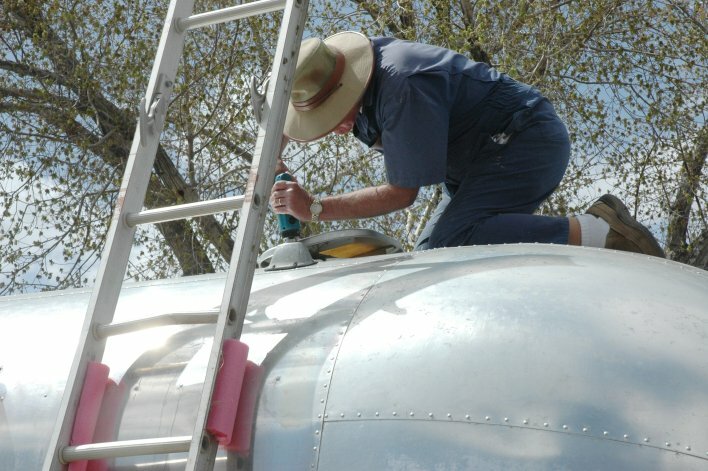 This is where you can see how someone else did something like replace an awning, install a new vent, or added a gray water tank to their trailer. The latest addition is the story of replacing an original vent with a new MaxxAir vent. Springtime weather. Good friends. New friends with Airstreams. Fish jumping. Owls surviving. Batteries charging. Meetings deciding. Rain on the roof. Sand everywhere. Yep, there’s Airstream RV’s down there! Can you pick the flowers? Back in grade school, a common project in Texas was to make a notebook of pressed wildflowers. Urban Legend recently discussed the rumors about it being illegal to pick wildflowers such as the Texas bluebonnet. While there are restrictions about private property, property damage, and stopping on freeways, the actual picking of wildflowers on public property isn’t, in itself, illegal. This is generally the case in most states. The Nevada Native Plant Society discourages the collection of live plants but refers to Nevada Revised Statutes 527.050 for details. In Nevada, you have pretty much the same restrictions as Texas. If on public lands not in parks you are probably OK to pick a flower if you don’t do any damage to the land and don’t abuse traffic laws to do it. The NNPS page also has a number of good links for those interested in Nevada native plants. They do field trips, too, so check it out! The Sierra Club also plans some May hikes around Reno. See the Great Basin Group website. If you are looking for California wildflowers, Wandering Lizard will tell you where to find what when. There are a lot of pictures to see at that site, too. Friends of Nevada Wilderness has a slow to load home page because of the pictures. The concern is about mass collections and the destruction of habit and the extinction of species. An occasional flower picker usually isn’t a problem. Nowadays the big problem is the off road vehicle enthusiasts that tear up the terrain, especially anywhere near the large population centers. A number of those enthusiasts are worried about the impact on their hobby so they promote staying on defined trails and playing in the sand. Wildflower season is a good reason to get out and see the country with your camera. The Texas bluebonnet and paint brush vistas aren’t so common in Nevada but there are times when a wide angle lens can capture a stunning view. And then you can use the macro lens for a closeup of a particular flower or plant. If you listen as well as look, you might just also hear the buzz of the bees, too. April brings spring storms. One of these made life difficult for a family of horned owls. 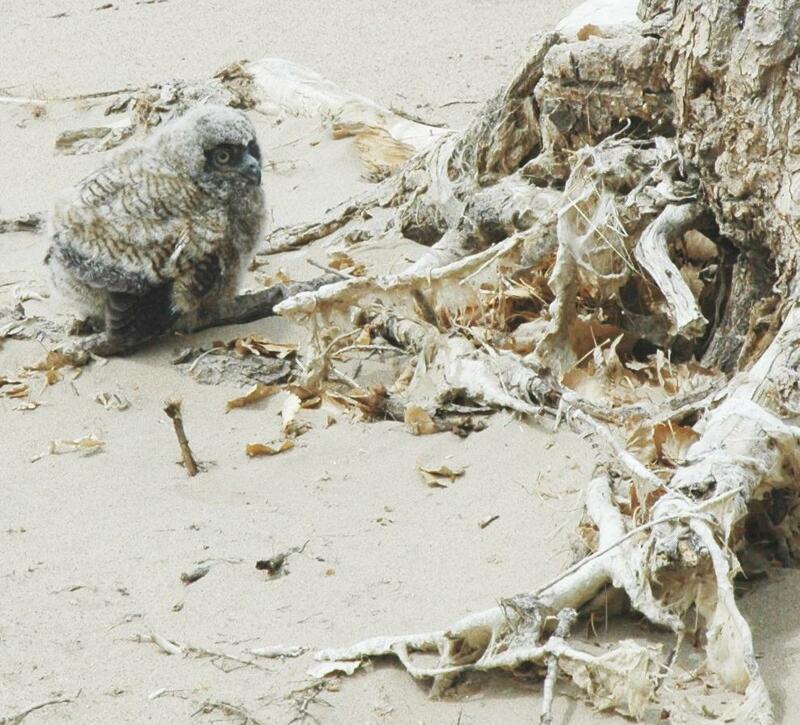 Three chicks were blown out of the nest about ten feet off the ground at the Lahontan beach – a favorite camp spot. One did not survive the fall, another scampered away from anyone approaching and the third was cowed (picture) and acted more like a fuzzy tree stump in the sand than anything else. The parents were seen nearby watching over the owlets. It’s not often you walk down a camp road and find a horned owl perched just overhead keeping an eye on things. This beach was the rally site for the WBCCI SNU so the owls became a bit of a project. The rangers and the park service did not respond to telephone calls about the situation. A passing camper, on the way to the bath house, caused Scamper to get a good ways from his tree and Cowed to also move a bit away from the nesting tree. But the campers pretty much left the surviving owlets alone, the dogs didn’t bother them, and they survived a few more nights. Before the rally dispersed, Scamper had managed to cross over the campground road to find cover in a thatch of grass near the base of a tree in a nearby meadow. Cowered was still making like a fuzzy stump in the main camping area so Jerry grabbed a crate, scooped up Cowered and took him over near to the tree near Scamper. When everyone left, the surviving owlets were at least off the main camping area, in a spot where they could hide in the grass and have some protection, and where their parents could try to take care of them. Will they survive? Nature can be cruel at times. At least, this time, they had a bit of a respite and were less likely to be disturbed by camping at the beach as the weather recovered after the April storms. The computers are coming! The computers are coming! Your tow vehicle probably already has a bunch and, especially if high end, you have access to them for information and entertainment. But you can fill in what you don’t have, too. Popular Science has a rundown on a DIY Dashtop Computer and the Geek Valhalla blog has a photo story of a Carputer Test and an Infiniti G35 Carputer Installation. What you can have is GPS Navigation on a screen much larger than most $800 navigation thingies have, an entertainment center, and a readout of OBD data from your computer such as miles per gallon and other performance parameters. You can also hook up Internet access to enhance these capabilities and provide email and web browsing while on the road. These are general purpose computers that can run your favorite operating system and all of your favorite programs. What you need, besides a small form factor computer, is a special power supply designed to power computers from an automotive 12v system, a touch screen display, a GPS antenna and receiver, an OBD connector and reader, a rear view camera, and some way to install it. That is where the pictures can help you figure out what you are into as the installation is likely to be the most difficult part of the whole deal. The components are becoming more readily available. Low power compact computers are not that expensive and the rest of the hardware is readily available and the standards for connecting the parts and pieces are actually getting usable. Systems and software to support navigation, diagnostics, and media are also available. The costs for both the Popular Science and the Geek seem to run about one or two thousand dollars depending upon features and capabilities. That does not include the cost of the navigator and system operator that will be needed to use the thing. A driver should pay attention to the road and the driving task and not on the gadgets in the vehicle! The driver can either set things up before the trip or depend upon another person to handle the system en route. Under no circumstances should an in vehicle gadget demand or divert a driver’s attention and any programming, selecting, or reading must be doable with only a quick glance and a single sloppy button push at most. Drive safe, keep your attention on your driving. A front is going through now with another due Friday and another Sunday. The one going through now is bringing some rather stiff breezes which means warnings and prohibitions for high profile vehicles on north and south routes such as US 395 and Alt 94. At least, for the WBCCI Sierra Nevada Unit rally April 19 th at Lahontan Reservoir, that means the sand will be wet and more firm and the weather rather cool. That might mean the boaters will likely be sparse which is good if you like the natural experience or bad if you like to watch the show. Low temperatures, especially in the prep phase, tend to get very near to rig freezing levels. One way to tackle this is to set up a small space heater plugged into a thermostatic switch. You can often find these switches at home improvement stores. They are designed to handle 800 watts or so and will turn on when the temperatures get down under 40 F. One version looks like a three way tap. Spring weather is even more volatile than winter or summer so be prepared. When the weather turns interesting it is time to enjoy the benefit of your RV! Sunday, April 15, is the 300th birthday of Leonhard Euler (pronounced “oiler”), one of the most important mathematicians ever to have lived. His works help form the foundation of nearly all areas of mathematics, including calculus, number theory, geometry, and applied math. Perhaps one of the most important (and mathematically beautiful equations is Euler’s identity: eip = -1 where e is the base of natural logarithms, i is the square root of -1, and p is pi or the ratio of the circumference of a circle to its diameter. This equation may not be as well known as Einstein’s e=mc2 but it arguably more important as Einstein would have been lost without Euler. Euler marks the beginning of modern mathematics. This is where arithmetic and algebra and plane geometry meet trigonometry and calculus. Irrational numbers are bad enough but imaginary or complex numbers are an entirely different paradigm. And Euler managed to show how an irrational number raised to a complex value times a fundamental, but irrational, constant is equal to the additive and multiplicative identities. See? Beautiful, isn’t it? So let’s celebrate Euler’s 300th! >> We need your input! All SNU members were mailed a copy of our proposed revised bylaws. Please check it over and pass along any comments to the SNU. The bylaws will be voted on at the Lahontan Rally. >> Check out the SNU interactive calendar. The purpose of this interactive calendar will be to post the rallies but more importantly, it will be a place where members can add their own upcoming trips. •The ability to drive at a set speed for several miles up a defined slope. •Braking capability from a set speed. •Handling and stability in lane changes. This kind of rating will probably not make much of an impact on the ‘weight police’ that troll the forums to condemn anyone not using an HDT to tow a popup. But a good set of tests could well be useful to potential buyers and might start a fad like Vista has with its computer metrics. Larry Johnson has decided to step out and start his own business in the alternative energy sector with a focus on RV’s. You can see the stuff he is selling at his Charging Chargers website. Larry also has some very good tutorials to help you understand batteries and charging. He has one of the best rundowns, for instance, on the impact of load on battery life and about internal discharge at his battery tutorial page. One other topic he covers that is rather unusual and also attests to a modern orientation is in the DC-DC voltage conversion and supplies for 24v and 36v systems. Larry is in Rogue River, Oregon. 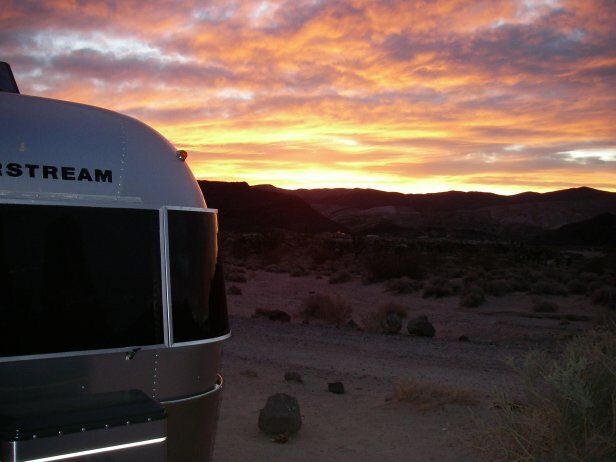 You might keep him in mind if you are planning an energy system for your RV. Another supplier is Infinigi. These guys might be more appropriate for home based solar energy systems. They appear to be a good source for a lot of hard to find stuff. The Fulltime RVer notes that the “King of Trails” Needs Volunteers. It seems that the Continental Divide Trail Alliance has a lot of work they’d like to do building and maintaining trails. There are as many ways to help as there are ways to enjoy the Trail…pick up a shovel and join a Trail crew, put your leadership skills to work as a crew leader, cook meals, adopt a section of the Trail, explore areas for optimum rerouting, or even work in the office. If you want to get involved, check their page for volunteer opportunities. — Might be something to consider if you plan to spend some time in New Mexico, Colorado, Montana, or Wyoming this summer.